Carbs have had a bad press recently. If you have type 2 diabetes in your family or if you have been told that you have “pre-diabetes” you could be forgiven for thinking that carbs and carbs alone are your number one enemy. So should you ditch carbs to reduce your risk of type 2 diabetes? There is no one size fits all approach to losing weight whatever you might read or see on TV! If you find that ditching high carb starchy foods like breakfast cereal, bread, pasta and cous cous helps you lose weight then that’s fine. Do this for a couple of months. If you want to do this for longer because you have a lot of weight to lose get some advice from your Dietitian to make sure you are doing low carb in the healthiest way. Make sure you are eating plenty of vegetables including beans and lentils, some healthy fats (see here for more information. Healthy Fats) some fruit, whilst avoiding dried fruits and tropical fruits and protein foods like lean meat, poultry, fish, eggs and sugar free dairy products. After a couple of months on a low carb diet most people need to take action to get their fibre intake back up. However if you have been working with a Dietitian you will have been advised on how to do low carb whilst still getting plenty of fibre. We know that high fibre diets especially diets that include wholegrains reduce our risk of heart disease, stroke, diabetes and cancer. You can increase your intake of unprocessed wholegrains whilst still managing the impact of food on your blood sugars. Instead of going back to wholemeal pasta, wholemeal cous cous, wholemeal bread and brown rice opt for lower carb, genuinely unprocessed wholegrains like wild rice, quinoa, wheat berries and steel cut oats. Make sure you buy them plain as commercial products often include sugars and processed carbs. Remember you still need to be careful about your portion but you can get away with a little bit more because these foods have a low glycaemic load. Glycaemic load takes account of both the rate at which the food releases sugars into your blood and the amount of carbohydrate in a typical serving. Obviously if you binge out on these foods you will take on more carbs and there will be a greater impact on your blood sugar. Some people particularly those who travel a lot for work or those on a lower income may find this way of eating difficult. Lots of my clients simply hate things like wild rice and quinoa. If this is you then don’t worry. There are plenty of ways to have a healthy diet. Switch back to having wholegrain starchy carbs but take care with your portion. Keep the cost of meals down by swapping some of the meat, poultry or fish for beans and lentils. Once you have reached a healthy weight, get your blood sugars checked again. If all is well and you want to continue with a fairly low carbohydrate diet long-term then get advice from your Dietitian. Low carb diets can be deficient in folic acid, magnesium, vitamin C and fibre. All of this can be managed but it requires some thought. 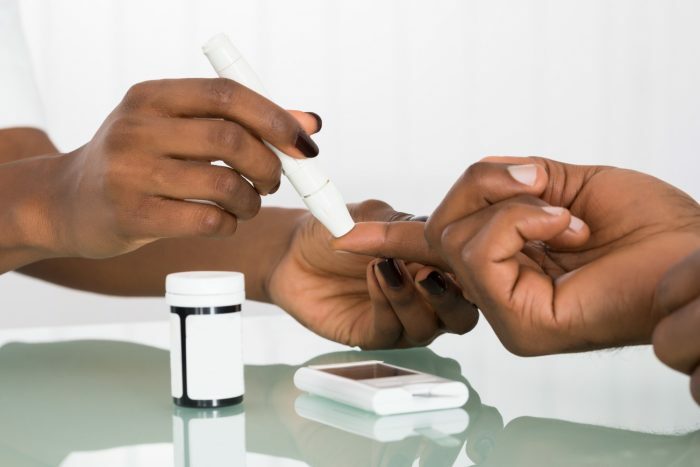 You should continue to have your blood sugars checked regularly. If your blood sugars are still high then see your Dietitian for advice as you may have been having significant amounts of processed carbs without even realising. Once you have reached a healthy weight get your blood sugars checked again. If all is well continue on a healthy eating plan with occasional treats and get your blood sugars checked regularly. If your blood sugars are still high see your Dietitian and discuss how you can get your carb intake down whilst still eating foods that you enjoy and can access. If you have pre-diabetes but your weight is healthy and you are already following a low fat diet with plenty of vegetables, wholegrains and some fruit then you may benefit from a moderate carbohydrate restriction. This means being careful about the portion size of carb foods like bread, pasta, rice and cous cous even if they are wholegrain. You should also think about other foods that might be contributing to your raised blood sugar. For example fruit is fantastic and offers lots of fabulous nutrients but some fruits contain more sugar than others. Reduce your intake of dried fruits and tropical fruits like bananas and mangos and have fruit as part of a meal rather than as a snack. When you do this you will automatically reduce the impact of the fruit on your blood sugar because the protein, fibre and fat in the meal will reduce the rate at which the sugar from the fruit is released into your blood. With regard to fat I don’t recommend going for a high fat diet unless you struggle with being underweight. Either way the fat that you do have should be largely monounsaturated or omega 3. Check out the “healthy fats’ link above. If you regularly have smoothies add some steel cut oats to increase the fibre and slow the rate at which the sugar enters your blood. Limit yourself to one 150ml glass. When thinking about your 5 a day aim for 2 fruit and 3 veg and include some green leafy vegetables as these are very low in carbs, seem to be protective against diabetes and provide lots of great nutrients like vitamin K which is important for blood clotting. Try swapping some of your usual carbs for lower carb, genuinely unprocessed wholegrains like wild rice, quinoa, wheat berries and steel cut oats. If you have a healthy weight and have tried a moderate carbohydrate restriction but still have raised blood sugars then there is mileage in trying a low carbohydrate diet. See your Dietitian for advice to make sure you do this in the healthiest way. Reducing our risk of type 2 diabetes is not just about carbs. We need to think about our diet as a whole rather than just being obsessed with single nutrients. Wholegrains, fruit and vegetables, especially green leafy vegetables, yogurt, cheese and even tea and coffee have been shown to be protective against diabetes. Meanwhile red and processed meats, potatoes, sugar sweetened drinks and refined carbs like white bread, rice, pasta and cous cous have been shown to increase our risk of getting type 2 diabetes. Physical activity is also important so aim for at least 30 minutes of moderate to vigorous physical activity daily. That means activity that leaves you struggling to talk in full sentences – not just a stroll! That said if for any reason exercise is hard for you anything is better than nothing at all. So in summary do you need to ditch carbs to reduce your risk of type 2 diabetes? No. However it does help some people and everyone at risk needs to think about the type of carbs they eat and their portion sizes. If you would like individualised advice and support please get in touch for an appointment. This entry was posted in Diabetes and tagged "type 2 diabetes", carbohydrates by Stephanie.fade. Bookmark the permalink.